This is part 1 of a 7 part series on that was originally written by Ken Guenther for the SEND U blog. You can find more training related posts there. We will post all 7 parts over the coming weeks. Enjoy! A question that we discuss at length during every Member Orientation is “How do you define success for yourself as a missionary?” As disciples of Christ, who have been called and sent out to make disciples of others, we can only consider ourselves successful if we believe that we have accomplished what our Master told us to do. Hearing the words “Well done, good and faithful servant” is our greatest hope and ultimate definition of success. How should we live and serve today, so that we can be assured that we will hear those words when we stand before the Master and give account to Him? My first extended time of reflection about this question happened about 5 years ago. Our International Director stood with me in a cafeteria line at a LeaderLink training in Florida, and asked me how I would define success for SEND in Far East Russia. I had no answer for him. I had never been asked that question before. But that question would not let go of me. I returned to Russia, where I was leading our work in the Far East, and began to think deeply about this question. Providentially, in my personal devotions, I was going through the book of 2 Corinthians, and I was struck by Paul’s amazing confidence in God’s approval on his ministry. I ended up leading our team in Far East Russia through a series of studies of some key principles from Paul’s self-reflection in 2 Corinthians. This process culminated in a formal definition of success that we adopted as a field at our annual conference in June, 2007. In the next couple of blog posts, I want to share some of what I learned through that process, and what I am still learning as I read and reflect, and re-read Paul’s second letter to the Corinthian church. Paul knew that God was pleased with his ministry. 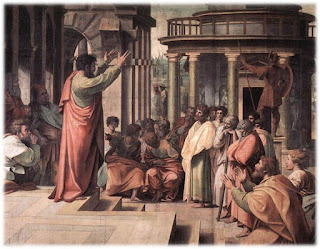 Despite the onslaught of criticism from the Corinthian church and the “super-apostles” that were visiting the church (2 Cor 11:5-15), Paul was confident before God that his ministry was not lacking or inferior (2 Cor. 3:4). He says that he is very bold (2 Cor 3:12), that he does not lose heart (2 Cor 4:1, 16), and that he is always of good courage (2 Cor 5:6,8). Interestingly, that same Greek word is used in the Septuagint when Moses says to God, “I have not been sufficient in former times, neither from the time that thou hast begun to speak to thy servant” (Ex 4:10). In effect, Paul is saying that he feels an adequacy, a sense of competency, whereas Moses did not. But that should not be surprising because Paul goes on to show why the new covenant ministry is far more glorious than the old covenant ministry (2 Cor 3:7-11). Moses had a fading glory, but in the Gospel, we see the permanent glory of God displayed in the face of Christ (2 Cor 4:4-6). Because those who really understand the Gospel, recognize and contemplate God’s glory in it, they are constantly being transformed into the image of Christ with ever-increasing glory (2 Cor 3:18). Paul realized that his competence was not because of the quality of the messenger but because of the quality of the message. The message, this unimaginably valuable treasure that he had embraced, had made him a glorious messenger, fit for the Master’s service. Missionaries face many challenges to their sense of confidence. Whether or not they are openly criticized for their accent or grammatical mistakes, they often lack in confidence that they can clearly and powerfully communicate their thoughts in the local language. Particularly in the first term, missionaries struggle to say things that a child can say with no difficulty. This limitation greatly undermines a missionary’s sense of confidence in their ability to teach, lead or witness boldly. They often miss the cultural cues that alert a cultural insider to what people are really thinking or what their real needs are. Although some cultures automatically grant a white foreigner status because of his race, education and financial resources, in many other cultures, particularly in Europe and Eurasia, credibility is earned only after many years of faithful service. The missionary is viewed with suspicion, just because he is an outsider. Then we have to deal with the question of what we do for a living, and the bewilderment, and maybe even disdain, of others when we identify ourselves as missionaries. To people like us, Paul is a great encouragement and example. He was not of Greek descent like the Corinthians. His education, although definitely noteworthy in a Jewish context, did not resemble the training given to typical Greek rhetoricians and orators. In many ways, he was an outsider to the church that he planted. He was criticized for his lack of credentials and unfavorably compared to other orators and teachers, like Apollos. He was accused of being an imposter (2 Cor 6:8) and subjected to all kinds of hardships and rejection (2 Cor 6:4-10). Yet despite all this, Paul is confident that God not only can use him, but that he is a competent minister. He remains absolutely convinced that his ministry is not only acceptable, but glorious, even more glorious than that of Moses! Any reason why we couldn’t say those same words?